Nine Nights Festival, popularly known as the great Navratri festival of India has over the period of time become one of the major attractons not only for the locals but also for the tourists from all across the globe. This is a festival that is dedicated to Hindu deity Shakti and its nine incarnation where the 10th day is referred to as Vijayadashami. Here we are going to list the top 10 must experience major attractions of Navratri Puja Festival. One of the major highlights of the Navratri festival remains to be the temples all around the different places of the nation. People decorate the temples of Goddess Durga elegantly and beautifully using the flowers, leaves as well as petals in addition to obviously the Idols of Goddess Durga. The decorations are done in different ways at different places using almost the same type of things still you can sense the difference and own beauty in each and every form of decoration. No occasion seems to be complete for us, unless it includes dancing in one form or the other. Similarly, the Aarti dance in Durga puja is considered to be one of the main ritual of the worship as a part of Durga puja. Especially in Bengal, during the Durga Puja ritual drummers, dhakis, carrying large leather-strung dhak, display their skills while the ritual dance is performed. This form of dance is also called Dhoop dance. Navratri is one of the most special occasion and any occasion that is special to us is incomplete if we do not talk about moyuth watering food. On this occasion all the special and the most traditional dishes are prepared so as to offer to Maa Durga. Some of the most special Navratri recipes that will water your mouth includes Sada Aloo,Sabudana Kheer and Singhare Ka Halwa. In our nation, the girl child is the representation of the forms of Goddess Durga. Thus, to celebrate and honour the same, they are attractions of worship on the eighth and ninth day of Navaratri. This puja is popular by the name of Kanya Puja. Nine young girls are represent the nine forms of Goddess. So, girls are worshiped and offered bhoj. In addition to this they are given new clothes in the form of gifts so as to mark respect for the Goddess. Ayudha pooja is also known as the Astra Puja. It remains to be be the reason of great celebration on the ninth day. It is an important part of Navratri and Dasara. On this day, there are a lot of things that people worship. These include things like books, vehicles, weapons, Bommala Koluvu, tools and all the other equipment. The two of the most famous traditional folk dances of Gujarat as well as Vrindavan are the amjor attractions. These are the Dandiya Raas plus the Garba Dance. The former is performed along with Garba on the Navratri evenings at almost all the places in the country. The highlight among all the states in the nation remains to be Gujarat. On the eventual day of the Durga Puja Festival, the idol of Goddess Durga is immersed in water body in the presence of thousands of devotees who bid tearful farewell to Mother Durga. This marks not only the end of the Nine day Durga puja festival but it also marks the beginning of Vijayadashami. The 10th day of the navratri puja festival is celebrations of Vijayadashami. It is one of the most vital Indian festival. Vijayadashami is also popular by the name of Dussehra and is the celebration to mar the victory of Goddess Durga on the demons Shumbh and Nishumbh. Also, it mars the victory of Lord Rama over Ravana, the demon king. Effigy of Ravana who was considered to be the 10-headed demon is burnt on Vijayadashami. All this is done in order to celebrate the triumph over the evil. One of the most attractive things that we have left for the last is the idol of Mata Durga and Kali. These are the best attractions to experience during this puja. These are placed in pandals along the roadside. These pandals are well decorated with the help of artistically depicted idols of Goddess Durga. The idols range to 50 feet in height and 40 feet wide. 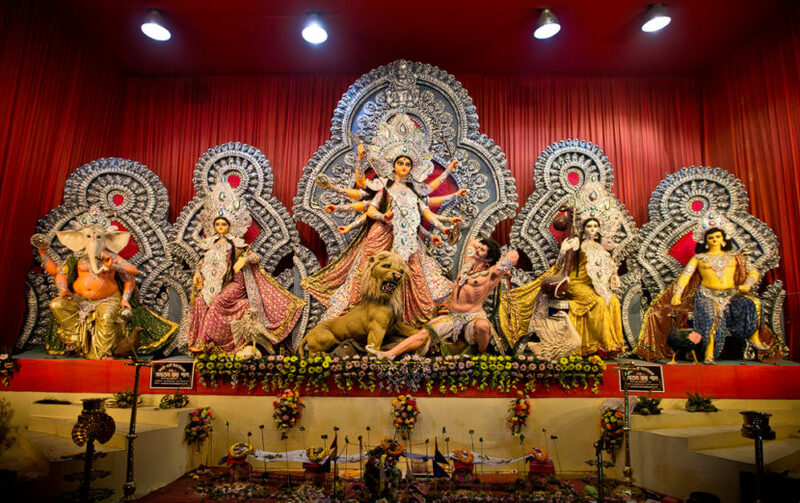 Kolkata durga puja is famous for the most unique celebration of Navratri. Here you get to see the best Durga Idol and pandals. All in all, these are the top 10 must experience major attractions of Navratri Puja Festival. Only if you notice these, will you be able to experience the beauty of these things that lies within.